India earlier on the first day were tottering miserably as they had lost early wickets hence South Africa ending up on a high .On the second day with India dismissed at 205, South Africa might have a notion that they have done enough. Dale Steyn was the star for South Africa , as he bagged six Indian wickets.This also made his 15th five wicket haul in just his 45th test on the go.He also has the best strike rate of 39.6 amongst the bowlers who have picked more than 200 wickets. But when the South African went on to the bat, India, test world number one were showed what they are made up of. South African batsman had no clue absolutely where they were heading to.With one of the best test batting sides in the cricket, they were totally beaten by everything, pace and spin, and ultimately were appalled and dismissed at 131. Thanks to some extra-ordinary pace bowling led by Zaheer Khan, who was out in the previous test made some serious impact.This in short produced 18 wickets for the day, making it a new record at Kingsmead. Currently India are 92-4 with Laxman and Pujara on the crease with the lead of 166. Though on second day the pitch had eased up a bit because of sun coming into play , allowing South African batsman to play in their flow. But it was not the case to be. But some hostile spells by the pacers led by Zaheer Khan, Ishant Sharma, and Sreesanth made look things pretty ugly for the South Africans.Not to forget Harbhajan who bagged four valuable wickets cleaning up majority of the tail enders.Only batsman who was looking to consolidate the innings was Hashim Amla , who was playing with the flow pretty well, until on 33 Harbhajan produced one straighter ball which he missed ultimately he was leg before wicket. 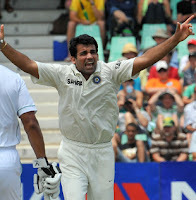 Kallis also got ran out on, who had pretty good run in the series, scoring his first double century in the first test. Today was also a special day for Rahul Dravid who today completed his 200th catch in the Test's, the list he is already leading. This came when he grabbed one off Steyn. Other than it was just like a pack of cards, nothing much of substance happening. With India with substansive lead , they would to consolidate and extend the lead upto atleast 300-350 in order to scare South Africans, with MS Dhoni , and the cheeky Harbhajan still to come they are always in a chance.